Mesosaurus was a genus of reptile that lived during the early Permian period about 320 and 280 million years ago. It was one of the first reptiles to return to living in aquatic environments. 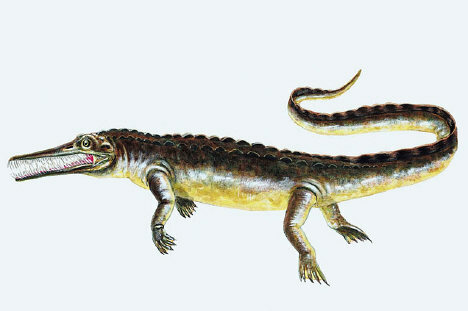 Outwardly, Mesosaurus resembled a small alligator. It had a streamlined body, webbed feet (the hind limbs were longer than its front limbs, and probably its main means of propulsion), and a long tail with a fin. A typical Mesosaurus was about 16 inches (40 centimeters) long, but the largest animals were up to 6 feet (2 meters) long. Mesosaurus most likely lived on a diet of fish, although another possibility is that it may have been able to use its teeth as sieve (as some modern whales do), and eaten small crustaceans.